I didn’t take the time to check whether or not this would qualify as a #ds106 audio assignment. If such a task is not on the list perhaps it should be. 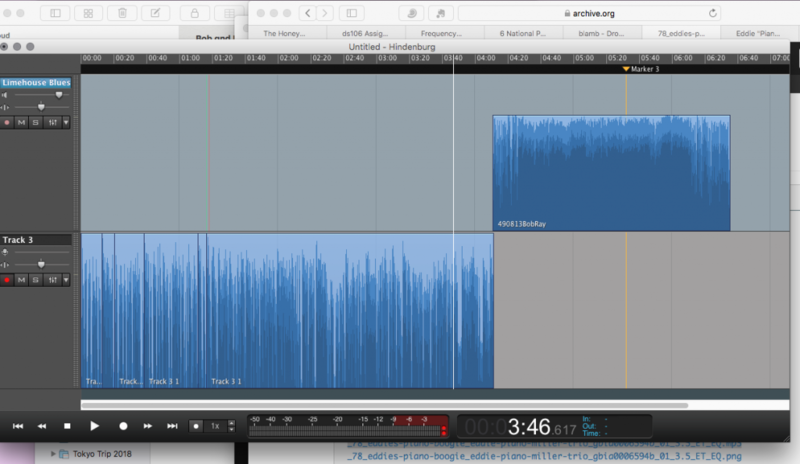 The whole point of this experiment was to edit some audio into an mp3 for upload to the blog. In this case, the audio consists of a four minute introduction recorded through a medium quality USB microphone into my laptop (2012 MacBook Pro) using the Hindenburg audio editor combined with an excerpt from a 1949 episode of Matinee with Bob and Ray. And what I’m most interested to learn from this experiment is how an mp3 file presents itself in a blog post. I don’t even know if WordPress will provide a player automatically. I imagine that I’ll want to look into some type of plugin for this purpose. And I’ll also have to relearn how to get an rss 2.0 feed to be generated for when this thing goes into podcast mode. This entry was posted in audio, ds106 and tagged experiment on December 9, 2018 by admin. So good to see “The Lo” back at the blogging and podcasting. Nothing exotic needed in WordPress for a media player. Just upload your mp3 as media (or elsewhere if you are doing mp3 hosting on some other service), and put the full URL on an empty line in the editor. WordPress will automatically make that an embedded player.